Easter Icons can be a good addition to your projects as it’s always good to freshen things up. You can also use these icon sets on easter cards and send them to your family, friends, colleagues. The following collection will feature some of the best easter icon sets that are free to use for a private or a commercial projects. Although its always good to check the licensing while downloading from a website. Most of the icons allow you to modify size, change colors and even skew their shapes. But don’t resell them. My favorite is that bunny in the eggshell 🙂 These twenty super cute icons will definitely cheer people up with colors and extra cuteness. Easter without colors and eatables is an empty day, you need to fill it with extra cool colors and effects. This is my selection from latest Dribbble icons and easter would be more fun when Dribblers get their credit. So, use these icons and support dribblers. It’s Easter icon pack. You can use these pictograms in various app design, web design, as well as branding materials. Infinitely Scalable. The carefully crafted shapes can be limitlessly scaled and will work great at any size. Set of 30 outline and colored vector Easter Icons. In this set each icon is named and placed is separate artboard. Easy to customize. AI, EPS, PNG, SVG files. PNG dimensions: 256px, 128px, 96px, 64px, 48px. 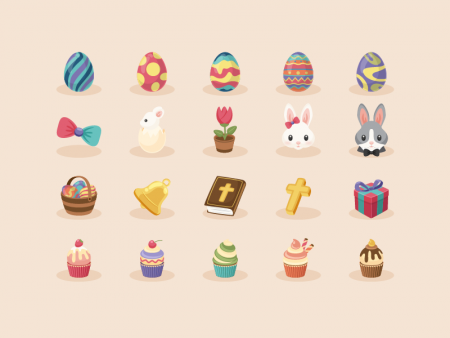 Vector collection of cute Easter icons for your card or invitation design.Flat stylized icons set. So, did you like our selection? Please share it with your friends and colleagues so that everyone can share the festive mood. Do subscribe our email newsletter and stay updated with latest freebies.